The first thing our visitors notice is the absolutely fabulous view over the Bay of Messara and the Paximadia islands. 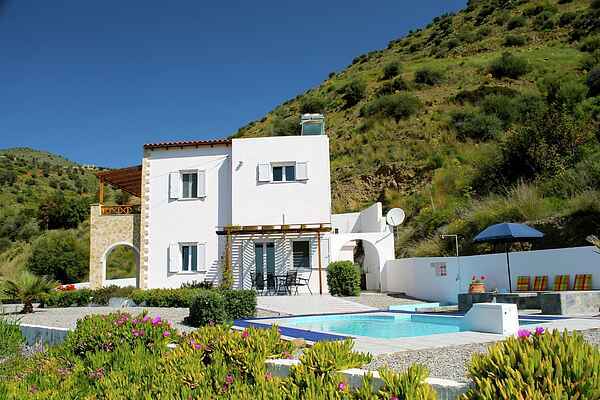 Villa Eleni is a unique villa about 3km from Agia Galini in South Crete with a secluded private pool and garden. The kitchen is well-equipped, spacious and airy if you can drag yourself away from the view to cook! Air conditioning is provided throughout. The location is wonderfully quiet and peaceful, broken only by the bells of the passing sheep. The pretty harbour village of Agia Galini is 3km away, and offers a wealth of tavernas, cafés and small shops. Agia Galini is a very friendly village, and is reputed to be where Daedalus and Icarus set off on their fateful journey. In recent years the village has benefited from a new amphitheatre and museum. It has also won an award for its cleanliness. South Crete is a great location for those that wish to get away from the crowd, offering stunning scenery, historic sites and beautiful uncrowded beaches. Historical sites of Faestos, Ag Triada and Gortys are very close as is the town of Spili with its Roman fountains. Diving, watersports and boat trips are available from Agia Galini. Come to Villa Eleni for peace, quiet and the fabulous view! At the villa is an information folder with recommendations for beaches, sightseeing and eating out in English, French and German. It's a great place from which to explore the delights of South Crete.